For some reason Print tool has started printing negatives that are too thin so they give really dark prints. 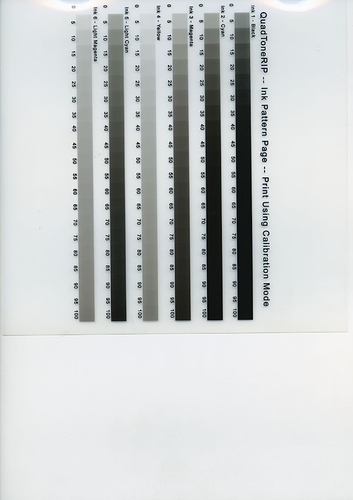 This problem happened over night - one day I was able to print negatives that were perfect, the next the negatives were too thin. The printer itself is in perfect working order the change in negative density happened on a day when Print Tool wouldn’t open and was unresponsive. First thing do a nozzle check. Third thing, make a new user on your computer and print from there. Thanks for getting back. The nozzle check was fine but neither reloading Quadtone RIP nor setting up a new user have had any effect. Please print the ink sep target to verify ink flow. Also please let us know what printer you have, etc. Can’t help without that. Sometime this printer can jam on the PK almost randomly. I’ve seen this happen once or twice over the past three years (and hundreds of customers). Solution is to purge with PiezoFlush with the small format flush kit. 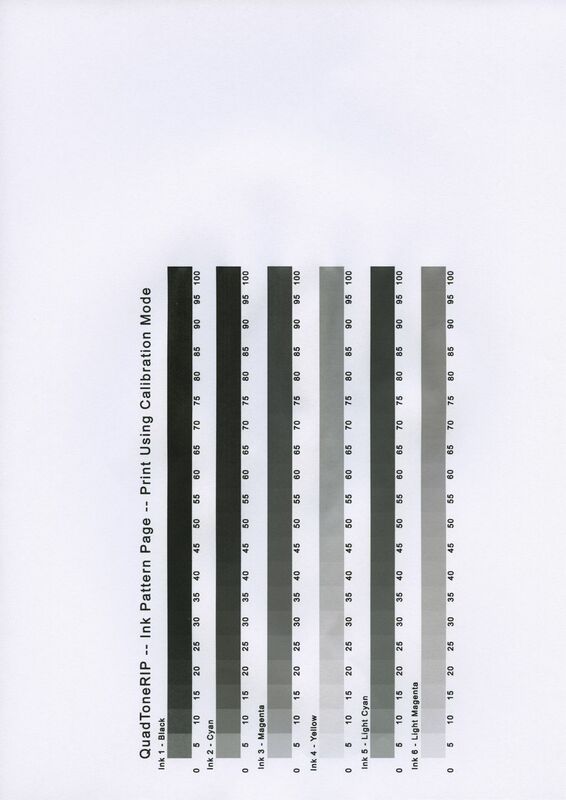 Alternative is to put the Shade 6 in PK and PK in Shade 6 slot. Then remap the curve. Excuse my ignorance what is PK? One thing I have noticed is the the linearised curve is not in the curves folder in Piezography. All my other curves are in this folder. the curve does appear in the list of curves available in Print tool though. It’s hard to tell from this shot if there is lack of dMax on the black. I need you to look at the K (top) band of ink vs the C (next one down) and tell me if the K is opaque at 100%. Please zip and upload it here so I can take a look. 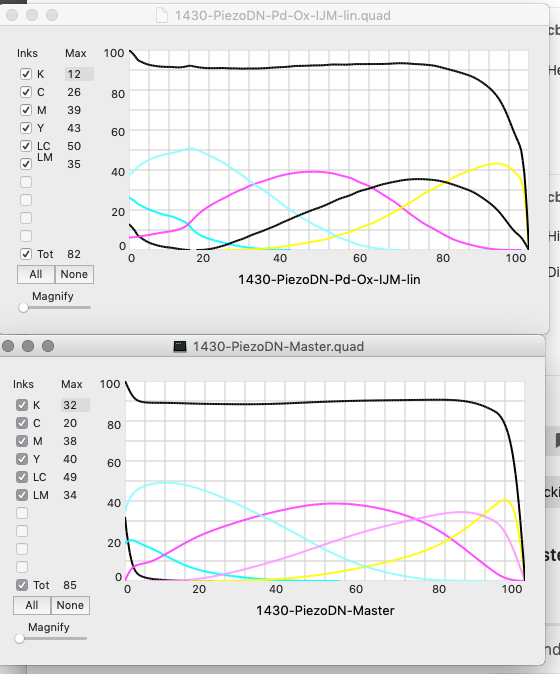 Did you get a chance to look at the linearized quad? I did. I still don’t know why it would lose density like that however you are using a pre version 2 curve. Density was added when v2 was published. 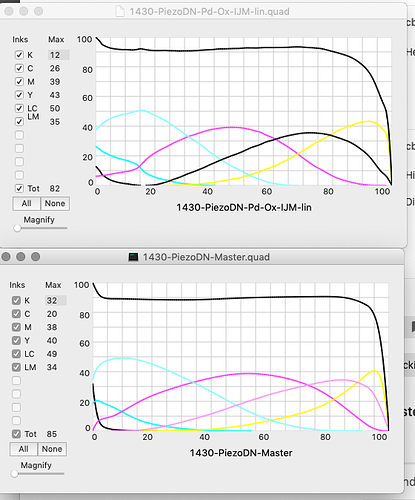 I went ahead and did some trickery and merged your linearized curve into the master curve except in the highlights where the master curve maintains the higher Dmax. Should print ok. Let me know. Thank you. I’m now away until the week end but I will give it a go when I get back. Should I just drop this file into the same folder the other quad was located in? 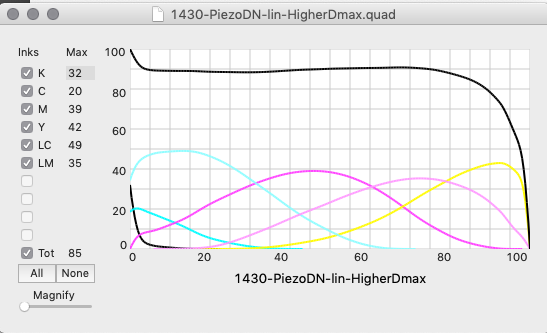 Drop into your curve folder in >Piezography>Curves>1430-PiezoDN and then run the install command to install the curve for printing. Thanks for all your help. Reinstalling the curves seems to have done the trick and my negatives are printing as normal. The problem seems to arise when, for some reason, Print Tool won’t open properly. Using the Install command seems to reload the curves and solve the problem. Thanks again for helping fix this.